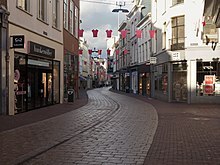 Arnhem (Dutch pronunciation: [ˈɑrnɛm] ( listen) or [ˈɑrnɦɛm] ( listen); German: Arnheim; Frisian: Arnhim; South Guelderish: Èrnem) is a city and municipality situated in the eastern part of the Netherlands. It is the capital of the province of Gelderland and located on both banks of the rivers Nederrijn and Sint-Jansbeek, which was the source of the city's development. Arnhem had a population of 156,600 in 2017 and is one of the larger cities of the Netherlands. The municipality is part of the Arnhem-Nijmegen Metropolitan Area which has a combined 736,500 inhabitants. Arnhem is home to the Hogeschool van Arnhem en Nijmegen, ArtEZ Institute of the Arts, Netherlands Open Air Museum, Airborne Museum 'Hartenstein', Royal Burgers' Zoo, NOC*NSF and National Sports Centre Papendal. The north corner of the municipality is part of the Hoge Veluwe National Park. It is approximately 55 square kilometers in area, consisting of heathlands, sand dunes, and woodlands. The oldest archeological findings of human activity around Arnhem are two firestones of about 70,000 years ago. These come from the stone age, when the Neanderthals lived in this part of Europe. In Schuytgraaf, remnants of a hunters camp from around 5000 BC have been discovered. In Schaarsbergen, twelve grave mounds were found from 2400 BC, which brought the so-called Neolithic Revolution to the area of Arnhem, which meant the rise of the farmers. Though the early tracks of settlements did show that the early residents of Arnhem descended from the forests on the hills, Arnhem was not built on the banks of the river Rhine, but a little higher along the Sint-Jansbeek. Arnhem arose on the location where the road between Nijmegen and Utrecht and Zutphen split. Seven streams provided the city with water, and only when the flow of the Rhine was changed in 1530, was the city located on the river. 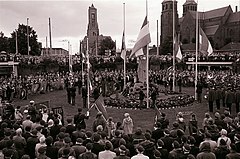 Arnhem was first mentioned as such in 893 as Arneym or Arentheym. 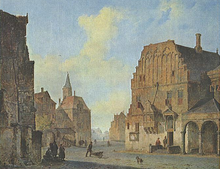 In 1233, Count Otto II of Guelders from Zutphen, conferred city rights on the town, which had belonged to the abbey of Prüm, settled in, and fortified it. Arnhem entered the Hanseatic League in 1443. In 1473, it was captured by Charles the Bold of Burgundy. In 1514, Charles of Egmond, duke of Guelders, took it from the dukes of Burgundy; in 1543, it fell to the emperor Charles V. As capital of the so-called "Kwartier van Veluwe" it joined the Union of Utrecht during the Eighty Years' War in 1579. After its capture from the Spanish forces by Dutch and English troops in 1585 the city became part of the Republic of the Seven United Provinces of the Netherlands. The French occupied the town from 1672 to 1674. 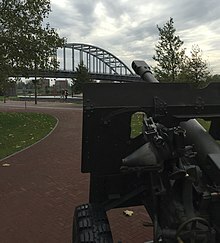 In the Second World War (1939–1945), during Operation Market Garden (September 1944), the British 1st Airborne Division, under the command of Major-General Roy Urquhart, and the Polish 1st Independent Parachute Brigade were given the task of securing the bridge at Arnhem. Glider infantry and paratrooper units were landed into the area on 17 September and later. The bulk of the force was dropped rather far from the bridge and never met their objective. A small element of the British 1st Airborne, the 2nd Parachute Battalion under Lieutenant Colonel John D. Frost, managed to make its way as far as the bridge but was unable to secure both sides. The British troops encountered stiff resistance from the German 9th and 10th SS Panzer Divisions, which had been stationed in and around the city. Arnhem consists of three districts (stadsdelen) and 24 neighbourhoods (wijken). Each neighbourhood has a number which corresponds to its postal code. The outlying areas of the following villages are bordering the municipality of Arnhem directly, which means among others that in many a case a considerable number of their inhabitants originate from Arnhem. The city lies a few kilometers from the border with Germany, and to some extent the westernmost villages in the municipality of Elten, Germany, function as dormitories for people who work in the Dutch city of Arnhem in part due to the immigration of Dutch people from the region that were attracted by the lower house pricing just across the border. The Grote Kerk (St. Eusebius' Church), built 1452–1560, lost most of its tower during World War II, of which a part has been reconstructed to a modern design and opened in 1964. Officially the tower is not part of the church and is owned by the municipality. The house of Maarten van Rossum, a general serving Duke Charles van Gelre, has been the town hall since 1830: The satyrs in its Renaissance ornamentation earned it the name Duivelshuis (devil's house). The Netherlands Open Air Museum is located outside the city. It includes antique houses, farms, factories, and windmills from different parts of the Netherlands. Two other windmills stand in Arnhem itself, De Hoop and De Kroon. The Royal Burgers' Zoo in Arnhem is one of the biggest and most-visited zoos in the Netherlands, featuring an underwater walkthrough, desert, mangrove, and rainforest. The GelreDome, the home of Vitesse Arnhem, the city's Eredivisie team in football, is a unique facility that features a retractable roof and a slide-out grass pitch. The concept has been fully duplicated since then by the Veltins-Arena in Gelsenkirchen, Germany, and the University of Phoenix Stadium in Glendale, Arizona, U.S., and partially by the Sapporo Dome in Japan (which has a sliding pitch but a fixed roof). The National Sports Centre Papendal is the national sports development centre of the Netherlands, located in Arnhem. The first event held at Papendal was the 1980 Summer Paralympics, from June 21 to July 5. However the site was formally adopted and developed from 1993, after the merger of the Dutch National Olympic Committee (NOC) and the Nederlandse Sport Federatie (NSF). NOC*NSF have 90 affiliated national sports organizations, representing about 2700 individual sports clubs. Papendal is also the training location of football club Vitesse Arnhem, and the club's youth development system. Supporting facilities include a conference centre and hotel. In preparation for the 2012 Summer Olympics, in 2011 the facility built a replica of the proposed BMX racing track at the London Velopark venue. The track will host the second event on the 2011 UCI BMX World Championships, on the 27 and 28 May 2011. Since January 2013 Sports Centre Papendal officially split from NOC * NSF and thus as organization demerges. This split offers Sports Centre Papendal many commercial benefits. There are facilities for various sports, including athletics, cycling and more. 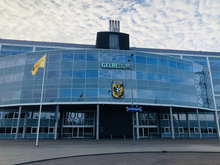 Sport in the city is principally focussed on its association football club Vitesse Arnhem and its stadium the GelreDome built for the UEFA Euro 2000. The club has enjoyed some success in the Eredivisie and has featured in the UEFA Cup competition. Their best result in the Eredivisie was third place in 1997–98. The club won the KNVB Cup in 2016–17. Introdans is a dance company based in the city of Arnhem. In 2009 the Ministry of Education, Culture and Science designated Introdans part of the basic national infrastructure. In 2016 was the Giro d'Italia in Arnhem. 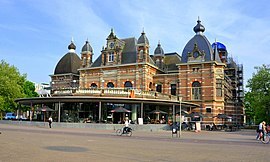 Arnhem has had a main central railway station since 1845 – Arnhem Centraal railway station, which is serviced by several intercity lines and the Intercity-Express to Düsseldorf and further on to Frankfurt. Nowadays, there are also NS International trains to other destinations abroad, with some coaches going as far as Moscow. The intercity lines provide direct connections to Utrecht, Nijmegen and Zutphen. It is also the terminus for several local railway services. Arnhem has three other stations, namely Arnhem Velperpoort (since 1953), Arnhem Presikhaaf (since 1969) and Arnhem Zuid (since 2005). KLM Royal Dutch Airlines operates a bus from the train station to Schiphol Airport for KLM customers. Arnhem is unique in the Netherlands with its trolleybus system. ^ "Ahmed Marcouch (burgemeester)" [Ahmed Marcouch (mayor)] (in Dutch). Gemeente Arnhem. Retrieved 10 June 2014. ^ "Postcodetool for 6811DG". Actueel Hoogtebestand Nederland (in Dutch). Het Waterschapshuis. Retrieved 10 June 2014. ^ "Over ons (About us)" (in Dutch). NOC*NSF. Retrieved 4 December 2010. ^ Ollie Williams (25 March 2011). "Building a London 2012 venue - in a Dutch forest". BBC Sport. Retrieved 25 March 2011.